Three of our 2018 Summer Interns share their experience and advice. I was drawn to Janney because of the location and reputation. 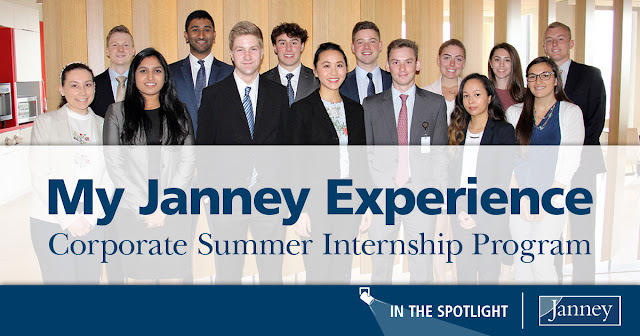 I had heard many good reviews from previous interns about Janney’s internship program and knew that spending a summer interning here would be a worthwhile experience. Upon my arrival, I quickly learned that many of my projects vary on a day-to-day basis. Most of the time, I am concurrently working on multiple assignments for different teams within the Legal & Compliance department. Attending meetings has helped me better understand the application of my work and the overall roles of each team within the department. This internship will help me in my career because it directly pertains to my future goals. As an aspiring attorney, working within the Legal Department has provided me with significant insight into how in-house legal departments operate at large financial institutions. This internship has helped me construct the path that I would like to pursue post-law school and the people here have provided me with the guidance to do so successfully. While I worked on several projects that spanned many different teams and larger department initiatives, one of the most interesting ones I worked on was within our Litigation and Regulatory Affairs Team. I was given the opportunity to help draft a response to a Statement of Claims that our Litigation Team had received during a pending arbitration. Considering my long-term goal of one day becoming an attorney, this was an ideal assignment and something that I was thrilled to work on. The entire intern program was memorable. The program tipped off with an Escape Room on the first day during our orientation, and concluded with a Lunch & Learn on the last day. All of the programs really helped shine light on the different aspects of a professional position that are not immediately apparent while sitting at a desk and doing work. Over the last 10 weeks, my Intern class and I have all gotten very close. Although many of us worked in different departments, we shared the challenges of having a new role in a professional setting. While I look forward to the future, I can certainly say I will miss many of the members of my fellow intern class from this summer. As an Economics and Political Science double major, working at Janney was my first exposure to the financial world. During my first few days, I was learning new terms left and right and it felt like drinking water from a fire hose. I realized that an effective way of learning things was by going into meetings and writing down anything that I did not understand. After the meetings I would pop into someone’s office and ask them a few questions for clarification, which no one ever had a problem with. The people within my department were very supportive of my learning curve. They were always available if I ever had any questions. Any time I was assigned a project, they were available to provide me with all the details necessary, which really helped me understand more about the financial world. One of the most important things I learned this summer was the power of being organized and having an agenda at work. There were many different projects I was working on for different teams with different timelines. Keeping a list helped me stay managed and effectively complete my tasks in a timely manner. I learned to always take notes and ask questions. The majority of people have no problem answering questions and enjoy teaching you and helping you get acquainted to a new position. I was also able to validate my prior interest in law and confirm that this is definitely something I would like to pursue. Since this was my first exposure to finance, I realized that this subject matter is also something I enjoy. I confirmed that in the future I would like to seek a position that revolves around finance and law, similar to the department I interned in this summer. This summer allowed me to grow as a person and as a professional. This internship has provided me with invaluable experiences that have given me the insight I need to succeed in the next step of life. Ask questions and be curious. Janney’s unique way of allowing Financial Advisors (FAs) to market themselves is really what drew me to this internship. FAs request many types of marketing materials from the Marketing and Communications team, which keeps the day in the Marketing Department busy and interesting. My daily activities include drafting and finalizing marketing requests from FAs. I create and design event invitations, advertisements, billboards, brochures, emails, greeting cards, etc. I have had the opportunity to work hands on with the department to create materials that keep FAs connected to their clients and draw new clients in. This internship gives me a huge advantage in my future career because I have been able to learn how to take criticism and rework my projects to make the end product more in line with what the client wants. I have also corresponded with outside sources to arrange advertisement placements. Working at Janney taught me how to work within a small department and handle multiple projects. A few things I have really enjoyed about my internship at Janney are the projects I worked on. I like to think I am one of the lucky few that found a career in something I really love, and working at Janney only furthered this. I also liked interacting with people in my department as well as my fellow interns. I was pleasantly surprised at how welcoming everyone was and how quickly I felt like I belonged. One challenge I met during my internship was having a lot of work given to me at one time. I had to manage my time so that I able to finish all my projects in a timely matter and prioritize certain projects at the same time. Once I planned everything out, I was able to easily get through it all. Another challenge I faced was having to edit my work. Whether it was a FA or a supervisor, I had to shake it off and realize that in the end, the direction allowed me to make my work that much better and eventually exceed expectations. My supervisor was a big help. He helped me prioritize my work and I never felt rushed to finish everything at once. I feel like I have progressed as a graphic designer because of his guidance. I learned how to work as part of a team and how to carry myself in a workplace. I also learned that no matter what work you are given, be happy to do it. It makes the days much better by having a positive attitude about the work you are doing. My biggest takeaway, specifically for the marketing field, is that taking others ideas and opinions into consideration goes a long way in helping produce better work. Collaboration is key. Take every opportunity given to you. Growing up near Villanova, PA, I became familiar with Janney’s reputation near the end of high school. I had a passion for finance and made an effort to familiarize myself with the strongest Philadelphia based financial services firms. During my research, I discovered that Janney is in a unique position, as it is one of the few privately held full-service financial firms in the Northeast. It is this favorable distinction, along with dozens of additional strong suits, that brought me to Janney and I have not regretted my decision for an instant! On a daily basis, I assist my manager in performing due diligence research on Janney’s fee-based platforms. Along with this task, I tend to work on one major research project a week. For example, two of the larger projects I worked on revolved around LIBOR’s phase-out and the new communications-services sector of the S&P 500 Index, which will be introduced in September 2018. The common (and most important) theme with my projects was that they all made a sizeable contribution to the productivity of the wealth management department. The industry knowledge that this internship has provided me with is nothing short of remarkable. Janney’s corporate atmosphere is energetic and productive, and promotes an educational element, which assisted me in understanding the inner workings of the firm. Furthermore, those insights will assist me in understanding which path I would like to pursue in the financial services industry. I like the fact that my work contributes to the overall production of the firm and having that validation allows me to work passionately throughout each workday. Along with fulfilling work, Janney is comprised of charismatic people who strive to succeed and make the firm a better place. For example, the transition into my role was seamless and enjoyable because my manager and coworkers were welcoming and inclusive, allowing me to feel like a part of the team from day one. There was no stigma around being “the intern”; rather, I was treated just like any other employee. Additionally, my fellow interns were great company, and by the end of our 10 weeks, it was hard to say goodbye! Overall, Janney does a tremendous job of fostering a friendly work environment that anyone would feel comfortable in. My first and last weeks were the most memorable. I enjoyed the challenge of adapting to a new work culture and making a good impression on my supervisors during week one – but also appreciated the ability to reflect on all my development and personal growth during the last few days of my internship. Some of my projects required extensive research before I was able to build a report or gather data on the topic of interest. I had to jump out of my comfort zone and spend a sizeable chunk of my workday taking comprehensive notes and reading up on topics in order to develop a project report that I was confident submitting to my supervisor. These moments were stressful at the start; however, I learned that there is nothing that you cannot accomplish if you set your mind to completing the task at hand. I came into my internship with the impression that I wanted to pursue the client-facing side of wealth management (Financial Advisor, CFP designation), but as the summer came to a close I realized that I enjoyed the research/investments side significantly more. I plan to pursue my CFA after I graduate from Pitt and I credit Janney and their internship program for giving me the hands on experience and industry knowledge necessary to come to this conclusion. Ask relevant questions, you are not expected to know everything! Carry a notepad and pen at all times. Use your down time efficiently.